tucked up under the birdhouse. 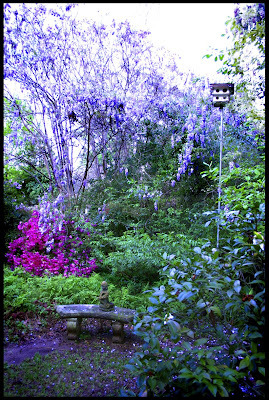 This year there is almost no wisteria. I'm sure it's coming soon. A lovely photo lush with blues and purples. At least on my monitor! I wonder if there are birds up in that bird house? so tranquil and mysterious. beautiful as always. your posts always makes me feel like that photo - all dreamy and full of secret corners, cool restfulnesses and new magical life.